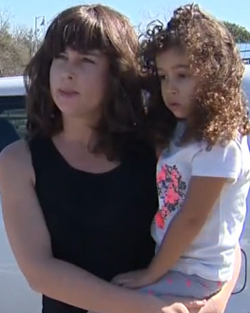 FEBRUARY 12--Police are investigating a Texas man for a series of road rage incidents, including one that was videotaped by a woman who last week was traveling with her four-year-old daughter when the suspect accosted her on an Austin roadway. Julie Nowlin, 39, told cops that as she was driving last Wednesday morning, a male motorist was recklessly veering across the road, crowding other drivers and trying to force them off the road. So Nowlin (seen at right with her child) reached for her cell phone in an attempt to record the man’s license plate. The other driver, however, apparently spotted Nowlin filming him. As traffic slowed, the man pulled his vehicle into a bike land and sprung out of his car towards Nowlin’s vehicle. “He got out of his car three times after chasing me around at high speeds and almost killing a female jogger,” Nowlin told TSG. Cops have classified the February 4 incident as "disorderly conduct abusive language" and "reckless driving." 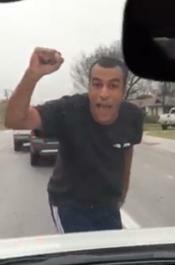 Nowlin uploaded video clips of the confrontation to a local listserv, which prompted a news report on an Austin TV station. That KVUE segment has caused other drivers to come forward with similar accounts of being menaced and chased by the same male driver. 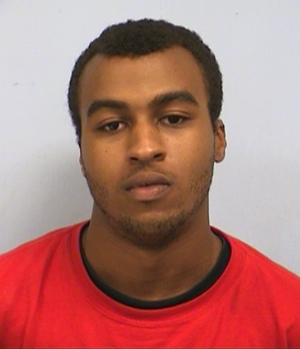 The recidivist road rager, TSG has learned, is Rashaad Devon Ben, a 23-year-old Austin resident whose rap sheet includes eight criminal convictions. Ben is pictured in the adjacent mug shot. According to Texas Department of Public Safety records, Ben’s first conviction, for theft, came in 2008 (when he was 17). Since then, he has been convicted of marijuana possession (twice), drunk driving, theft, resisting arrest, and driving with a suspended license (twice). He was most recently arrested in late-January for possession of drug paraphernalia.